What I love so much about this is the lack of grass. Mosses, horsetails, ferns, conifer scrub and basal flowering plants cover the ground. Weed and wheat like plants did not exist then. It was a different world, a primeval land. Has a feeling of what heaven might be like! This will adorn my desktop for sure. What a beautiful scenery. I love it. Great work. Very impressive. a lot of details. Stunning work! Wonderfully done! Congrats on your well deserved DD! A Beautifully Crafted Gallery ! Made Up Of Stunning Images .. Art At Its Best ! Some time ago you had some speed painting videos on Youtube. Don't you share anymore? Congrat for your work, it's awesome. absolutely beautiful! May I use this in a game for my classroom? This is breath taking beautiful scene. Awesome job! Holy cow, amigo! You always do amazing landscape stuff. You need to create some tutorials! wow!! impressive so many details in this fantastic piece of art. Magnificent! Congrats on the DD! well, wouldn't that be the whole point? point of what? The beaty of this image? to make them look old school. Even the colours look old style, I mean, I bet it was all made on purpose. I dont think so, but you could be right. So many details!! Very beautiful!! Congrats!! 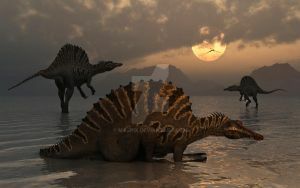 Dinosaurs...collectively among the most successful land animals that ever once existed on this Planet Earth...and definitely my most absolute favorite extinct prehistoric animals of all time! Congrats on teh DD - it is well deserved - your atmospheric perspective is excellent. amazing! love the details and the atmosphere!